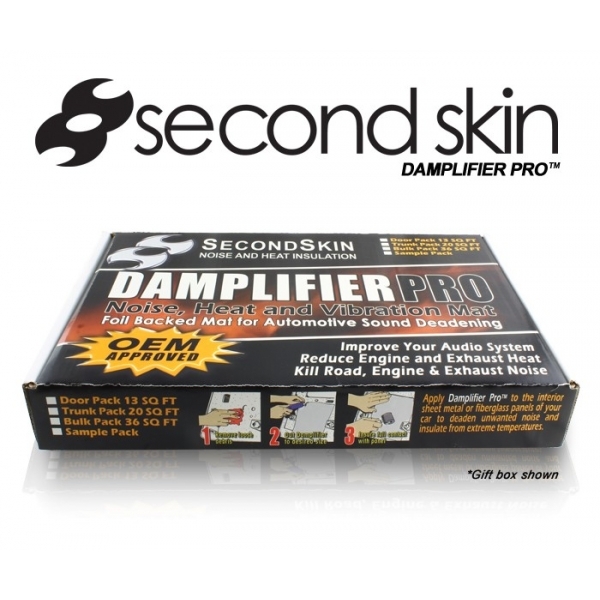 Damplifier Pro - The best CLD for vibration dampening on the market! We designed Damplifier to compete against the best and most popular constraint layer dampers (CLD) the industry has to offer while weighting and costing much less! Compare the weight & foil thickness to everything else, and you will see, Damplifier is the best automotive sound deadening value in its class! We designed Damplifier to compete against the best and most popular constraint layer dampers (CLD) the industry has to offer while weighting and costing much less! Compare the weight & foil thickness to everything else, and you will see, Damplifier is the best automotive sound deadening value in its class! Damplifier Pro is easily one of the best, if not the best self-adhesive CLD dampeners available in the market today. Besides being extremely effective, it is extremely easy to use, with a simple cut-peel-stick process that will only take you minutes at the most! Whether you are looking to damp out noise in your custom built street rod or if you are just trying to enhance your car’s audio experience, with significantly reduced road noise, Damplifier Pro is the best sound deadener that money can buy. Here are more specific reasons as to why. The thickest black foil – The USP of this dampener is the super-thick black foil that is used. With thickness that is almost twice that of what you will find in normal CLD dampeners and deadeners, it is no surprise that sound and vibration control is excellent, accompanied by ultra-effective heat dissipation. Rugged, industrial strength adhesive – While there are some CLD deadeners that can match Damplifier Pro’s foil thickness, none even come close to matching the high quality adhesive used in Damplifier Pro. Damplifier Pro’s heavy duty butyl rubber adhesive has almost 0% filler content, leading to a grip and set that lasts long and also drowns out sound and vibrations like no other product in the market. Heavy, thick & strong, all around – Damplifier Pro was made to outdo other CLD deadeners and vibration dampeners in every which way possible. As a result, it is not just thicker, but heavier and made of stronger materials as well, giving you significantly improved noise and vibration protection that is better than competitor products, even competitor products that are almost twice as expensive as Damplifier Pro. Damplifier PRO is simply THE best CLD sound deadener, built heavy, strong and durably, at a price that gives you fantastic value for your money. A step by step guide on how to properly install Damplifier Pro from start to finish. Reducing road noise in a car is an art. When a car rolls along a road, it picks up thousands of vibrations, vibrations that reverberate into the car’s sheet metal structure. Engine noise, tyre noise and even exhaust drone can all blend into a cacophony that we call “road noise”. If these vibrations can be blocked out, your car feels like it is virtually floating on the road. When Damplifier Pro is used on the inside of your sheet metals, in strategic locations where road noise is highest, it does an amazing job of capturing these vibrations, in a unique process that transforms vibrations into heat, heat that is then silently dissipated into air. In other words, Damplifier PRO reduces noise by converting noise vibrations into heat that is then expelled. This process is 300% more effective than the quality of noise reduction that a mass loader or tar board can offer. Mass loaders and tar boards simply drown out noise, very inefficiently. They are heavy, inefficient and not very rewarding when it comes to value for money. Despite these drawbacks, our competitors continue to sell them as “noise reducers”. Make a smart choice with Damplifier Pro, a sound deadener that is extremely easy to install, resulting in sound and vibration reduction that is 300% more effective than conventional sound deadeners that retail for much higher prices. This is a fantastic product to dramatically enhance your car’s audio experience, especially if you have invested in an expensive state of the art aftermarket audio system. When you operate a high end audio system or even a stock car audio system, you must understand that the vibrations emitted by the speakers will resonate off the car’s sheet metal under boards, bounding back into the general sonic area vicinity that is found next to the speakers. When that happens, the audio that you hear from your speakers is compromised or distorted. When Damplifier Pro is used, these resonations are cancelled out, allowing you to listen to crystal clear audio that you might have never experienced before. Additionally, Damplifier Pro significantly drowns out engine noise, road noise and the exhaust drone, to truly give you a concert hall like ambiance when you listen to your car’s audio system. Damplifier Pro produces even more stellar results when a product like Luxury Liner Pro is used on top of it, for added sound proofing. Damplifier Pro, besides offering best-in-class sound proofing, also offers three layers of thermal insulation. First, the thick foil used to construct Damplifier Pro, when used on the firewall side of the car, can just block out engine heat, leading to much cooler temperatures inside the cabin. Operating the car without air conditioners is a very pleasant experience and even the air conditioners will work more efficiently, as the air inside the car is already cooler. 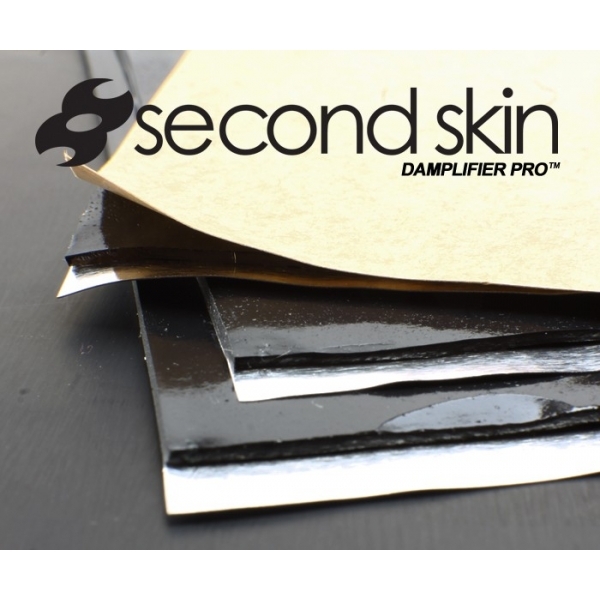 Damplifier Pro also contains a second heat shield that aids in thermal insulation by simply dissipating heat, by providing added surface area. Lastly, Damplifier Pro has a butyl layer that slows down any heat that has got past the two previously mentioned layers, allowing your car to remain cooler for longer. If you live in a very hot environment, it is recommended that you use Damplifier Pro along with Heat Wave and Heat Wave Pro, two other great products that can null out heat from the road and the environment. What specifically is the difference between Damplifier Pro and the standard Damplifier products? Both Damplifier Pro and Damplifier are very similar CLD sound deadeners. The only difference is that Damplifier PRO has an adhesive layer that is twice as thick as the adhesive layer found on the Damplifier vibration damping mat. The foil on either one of these mats is 6.5 mils in thickness. 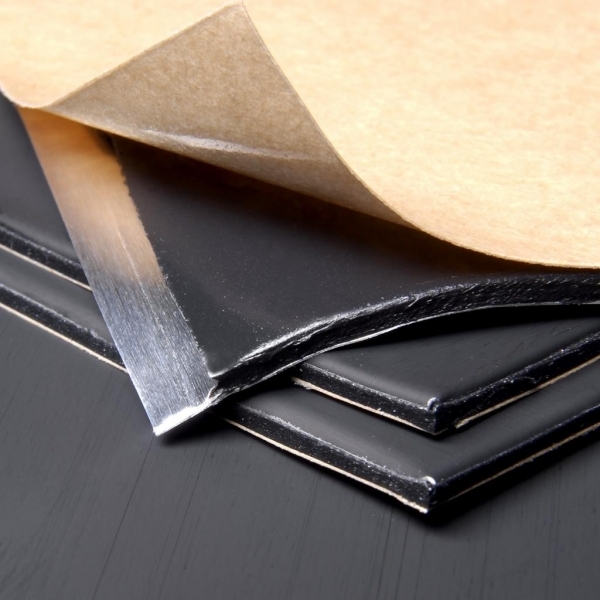 How is Damplifier Pro, manufactured by Second Skin, different from the generic asphalt roofing products or other sound deadeners that are available in roll like formats? 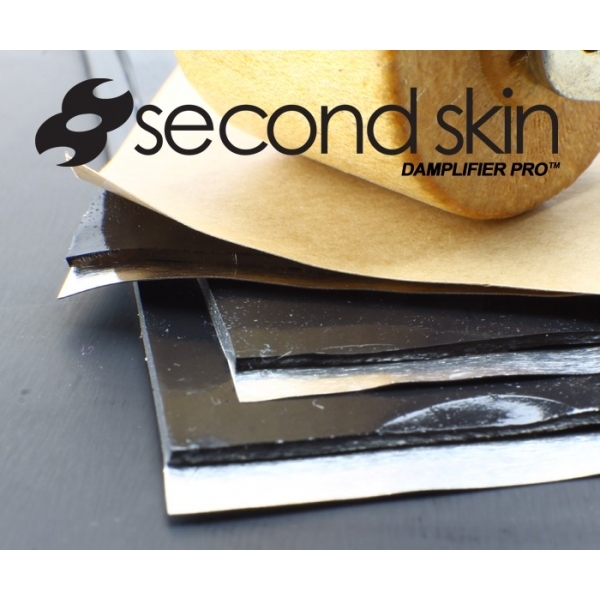 The difference between Damplifier Pro and generic sound deadeners and roofing products is that Damplifier is specifically designed for use in automobiles. Damplifier and Damplifier Pro are non-toxic, without odor and the best CLD sound deadeners available in the market. Unlike generic products that use a lot of filler in their composition, Damplifier uses 100% butyl binders, a feature that gives it its superior performance specs. Why isn’t Damplifier Pro not available in a more affordable roll like format? If you are wondering why other CLD sound deadeners are being sold in rolls while Damplifier isn’t, you are going to be in for a rude shock. If you see a CLD Dampener being sold as a roll, it is NOT a CLD dampener at all! The market is full of low quality roofing dampers that are simply sold as CLD dampeners. Putting a label on a product doesn’t make it a CLD dampener! Damplifier, Damplifier Pro and the few other genuine CLD dampeners that are sold in sheets are sold like that because they just can’t be manufactured in rolls. How much of a CLD deadener do I need to use, to properly deaden all the vibrations and noise in my car? This is a subjective question and the answer will depend on the type of car that you have, the type of engine noise that your car has, the quality of roads, the quality of your audio system and even on the exhaust drone that your car has. Generally, if you cover just your flat sheet metal panels with Damplifier Pro, you can get anywhere between at least 25% to 50% noise reduction. In some cases, it might even be 100%! If you however have a loud engine or a very high end audio system, you might need to use Damplifier Pro along with an extra layer of sound deadener like Luxury Liner or Luxury Liner Pro, to achieve 100% noise reduction.